At the TEDMED conference Rudy Tanzi spoke about the plan to end Alzheimer's disease by 2020. I wrote previously about Rudy Tanzi and his research -- Alzheimer's Disease A Sudden Flash of Genius. From my view, the research he is conducting along with his team of collaborators is important and exciting. I asked Rudy if he could give us a brief description of his vision. He agreed and you can listen to his words in the CinchCast below. Tanzi and his group have a plan. 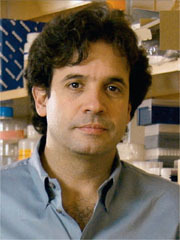 Dr. Tanzi is the Chairman of the Cure Alzheimer’s Fund Research Consortium and serves over 40 editorial and scientific advisory boards (see bio below). Please listen to Dr. Tanzi's words carefully. You might want to listen more than once to get a good understanding of his approach, plan, and a clear understanding of why he is optimistic. I understand that many in the Alzheimer's community are frustrated by the long list of clinical trials that failed to produce a drug to treat or cure Alzheimer's disease. This has fostered a pessimistic attitude about the possibilities for an effective treatment for Alzheimer's disease in the future. Rest assured that scientists like Tanzi are investigating new and different approaches aimed at stopping Alzheimer's. Science is move forward and the pace is quickening. My research is primarily aimed at identifying and characterizing Alzheimer’s disease (AD)-associated gene mutations/variants with the ultimate goal of defining the molecular, cellular, and biochemical events leading to neuronal cell death in the brains of AD patients. A significant portion of AD is caused by the inheritance of defective genes, while specific gene variants can increase lifetime risk for the disease. To date, four different genes have been implicated to play a role in familial Alzheimer's disease (FAD). My lab has been involved with the discovery of three of these genes, including (the amyloid protein precursor [APP], presenilin 1 [PSEN1], and presenilin 2 [PSEN2]) that harbor defects causing "early-onset" forms of the disease with virtually 100% certainty usually under 60 years old. Our studies are targeted toward determining the pathogenic mechanisms by which defects or variants carried by these genes contribute to the neurodegenerative process in the brains of patients with AD. For this purpose, we are employing cell-based and animal models including Drosophila. An in-depth understanding of the normal function of the AD genes and how mutations and variants of these genes can lead to ?-amyloid deposition, neuronal cell death, and dementia will be invaluable for the development of novel treatments for AD. Along these lines, our current focus is to translate knowledge gained regarding genetic mechanisms of neuropathogenesis of AD into drug discovery. We are also searching for genes that cause autism and related disorders. For a complete listing of Rudolph Tanzi's publications on PubMed, click here. For a more detailed bio go here. To learn more about the Cure Alzheimer's Fund go here.